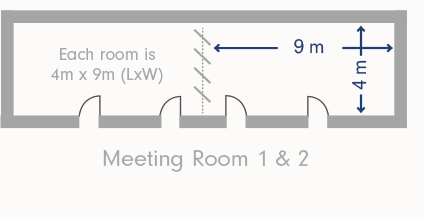 These 2 equal sized Meeting Rooms are the perfect breakout spaces for larger events taking place in our Woburn Hall as they are conveniently placed next door allowing for ease of movement of your attendees. Whether it be for a small side meeting, interviews or workshops these rooms have the flexibility to be set up in theatre style for 30, boardroom style for 20 and cabaret style for 16 and come with HD LCD Projector, glass whiteboard and flipchart included in the room hire price. Both rooms are fitted with a catering station allowing those all important refreshments to be delivered into your meeting for those working lunches. The rooms have a removable partition wall allowing them to be opened up into one room which can seat up to 60 in theatre style or 40 in cabaret style . Both rooms come with air conditioning and dimable lighting ensuring a comfortable environment for both long and short meetings. Each room is 4 x 9 (LxW) metres in size.